Upgrades to upper deck cabins are available on request. 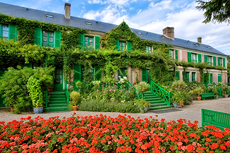 Experience picturesque Normandy while cruising the Seine, including two nights in Paris, the City of Light. Dine on superb French cuisine paired with an unlimited selection of wine and beer. Take part in daily shore excursions to explore the sites that inspired the famous Impressionist artist, Claude Monet, including the water lilies of Giverny and the Cathedral of Rouen. Visit abbeys and castles built by the Normans centuries ago. After dinner relax on board with musical entertainment or venture into the quaint towns for an evening stroll. 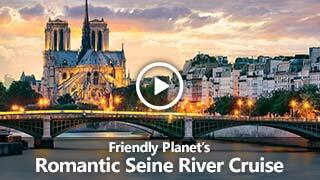 Accommodations: 7 nights on board MS Seine Princess. Included meals: Dinner. 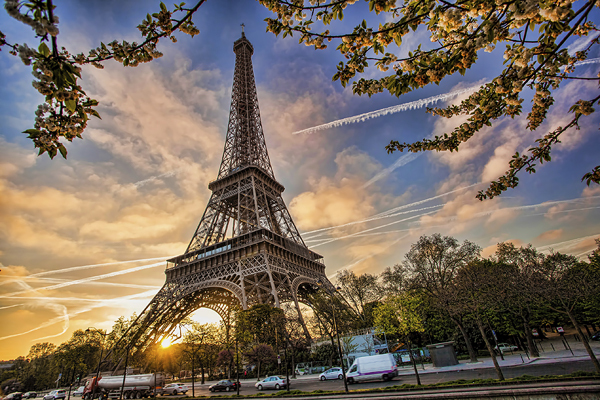 Arrive in Paris be met and transferred to your river cruise ship. Full Day Itinerary: Arrive at Paris Airport, where you will be met and transferred to the port. Luggage can be stored as of noon, and check-in is at 6:00 pm. After settling into your cabin, get to know the crew over a welcome cocktail, and dinner on board. Later, enjoy a cruise through Paris by night (depending on water level). Full Day Itinerary: Depart by coach for a guided tour of the mythical sites of the capital. Two thousand years of history have left their mark on Paris, since it was founded as Lutèce on the Ile de la Cité, with many churches, monuments, palaces, museums, and boulevards, as well as theaters and famous cabarets. Couturiers, perfumers and jewelers have built Paris’ reputation for taste and elegance. Drive past Bercy, the F. Mitterrand National Library, the Bastille, the Marais, the Latin Quarter, St Germain, the Louvre and Pyramid, the Opéra Garnier, Place Vendôme, the Concorde, the Champs Elysées, the Arc de Triomphe, the Invalides, the Trocadéro and of course the famous Eiffel Tower. The remainder of the day is at leisure in Paris. Lunch and dinner on board. Full Day Itinerary: Enjoy the morning cruising. After lunch, board your coach and travel to the home of Claude Monet in Giverny, where he lived from 1883 until his death in 1926. His passion for gardening and colors led him to see his flower garden as a piece of art. See the water lilies that inspired some of Monet’s most famous paintings. Monet said: "It took a while for me to understand my waterlilies... I grew them without thinking of painting them... A landscape doesn't sink in in one day... And all of a sudden the enchantments of my pond struck me. I took my palette. Since then, I've never had any other model." Visit the house with its pink façade, the warm tones of the interior, the intense blue of the kitchen and his small living room, and the yellow walls and furniture in the dining room, where you can see some of his private collection of Japanese prints. Return to the ship in Vernon. Full Day Itinerary: Cruise during the morning. After lunch on board, set off by coach from Caudebec-en-Caux with your guide. 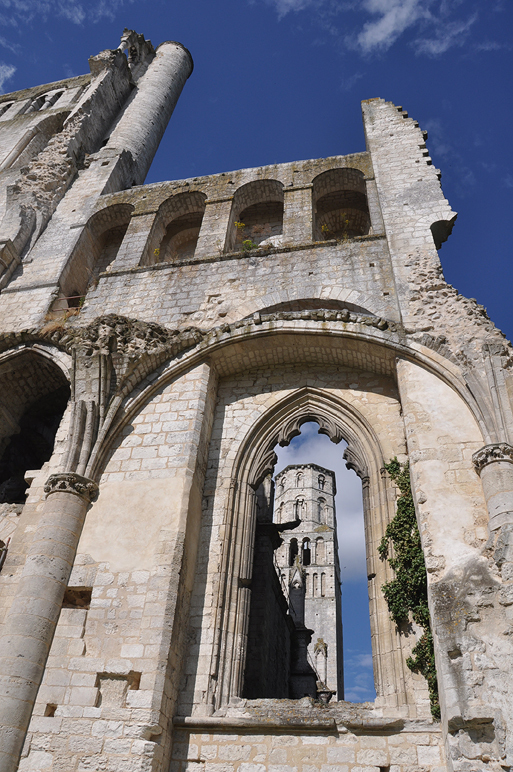 Visit Jumièges Abbey, built in 654 in the early days of Christianity and destroyed by the Vikings, it was restored in the 11th century. 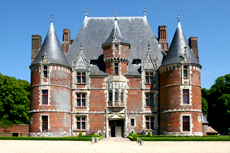 During the Romantic period, Victor Hugo described it as the “most beautiful ruin in all of France”, and it became well-known again. See the cloisters and ruins of the Church of Saint Peter, followed by an exterior view of the Abbey of Saint Wandrille (or Wandregisel). A congregation of Benedictine monks settled in the abbey in 1931, and today there are approximately 40 monks living here. Return by coach to the ship. 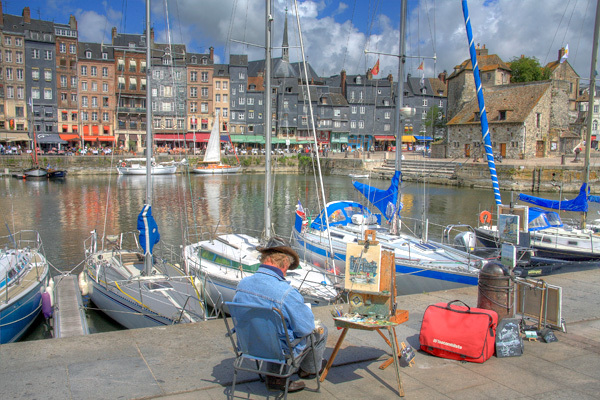 Full Day Itinerary: After an early breakfast, depart from Honfleur by coach for a full day trip. Arrive at Pointe du Hoc, which was the scene of one of the landings on Jun 6, 1944. After some time to visit, pass through Omaha Beach, Colleville sur Mer and its American cemetery. Stop for lunch at a local restaurant (drinks not included). Then continue to Arromanches, site of a famous battle, whose artificial port was installed to allow the invasion of land troops and their equipment. Next, stop at Arromanches 360°, where you will see a film “The Price of Liberty”, which combines archived footage from June 1944 by war correspondent with current shots of the same site. 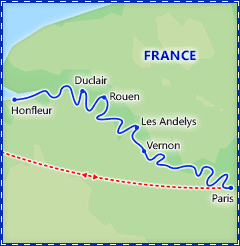 Return to Honfleur via Gold Beach and Juno Beach (Gray sur mer-Courseulles sur Mer – St Aubin sur Mer), Sword Beach (Ouistreham Lion sur Mer – Luc sur Mer). Arrive at your ship in the early evening. Full Day Itinerary: Spend the morning cruising and enjoy lunch on board. Depart on foot for a guided tour of Rouen, whose historic center is about a 5 minute walk from the ship. Rouen is the cultural, historical and gastronomical capital of Normandy. See the Gothic façade of Notre-Dame Cathedral, painted many times by Monet. 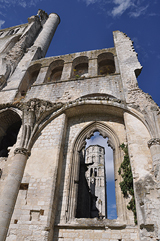 The cathedral was destroyed by Viking invasions in 841, rebuilt many times, and damaged by allied bombardments in 1944. Then, head to the market place where Joan of Arc was burned alive for heresy in 1431. 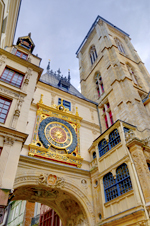 See the Gros-Horloge, or Great Clock, one of the most emblematic monuments in the city, whose Gothic belfry has housed the communal bells and clocks since the 14th century. Visit the Saint Joan of Arc Church, completed in 1979, located in the Old Market Place. Return to the ship on foot. Full Day Itinerary: Spend the morning cruising and lunch on board. Dock in Les Andelys, situated on one of the loveliest bends on the Seine River. Depart by coach, passing through Le Petit Andelys and other quaint villages along the Andelle River, arriving at Château de Martainville, built in the 15th century and has been a museum of Normandy history since 1961. See many artifacts from everyday life, such as copper pans and pottery, furnishings, as well as the famous Norman Armoires. Return to the ship in time for the gala evening. Full Day Itinerary: This morning you will disembark from the ship at 9:00 am and transfer to the airport for your return flight home. Later today, you will arrive in the USA. 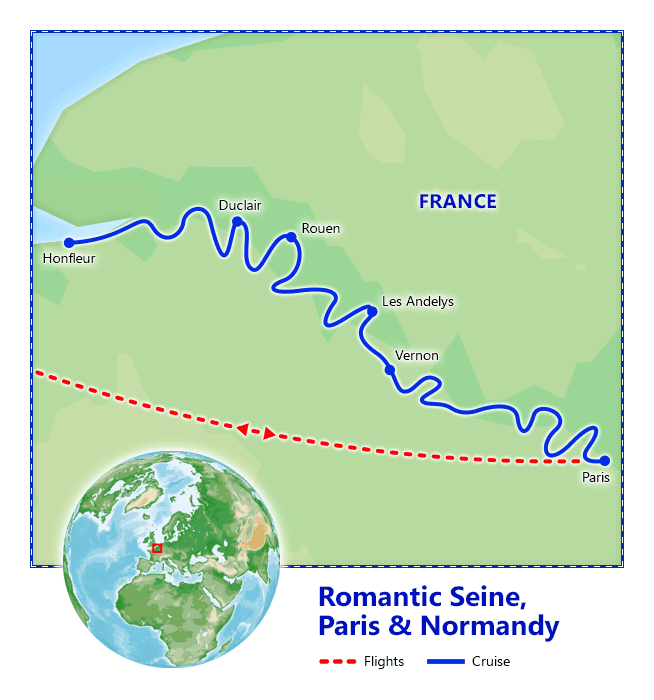 CroisiEurope’s MS Seine Princess is a superior first class cruise ship. It is spacious, and bright with a passenger capacity of 138 with 67 cabins. Once on board, you will find all of the amenities and comforts which distinguish CroisiEurope’s fleet, and the outstanding and friendly service which is the trademark of the staff and crew. CroisiEurope’s cruises always start with a welcoming cocktail reception, where you’ll meet the captain, crew and staff of your boat. What should I know about France? Check out our guide for travel tips, the best time to go, blog posts, videos, and more.